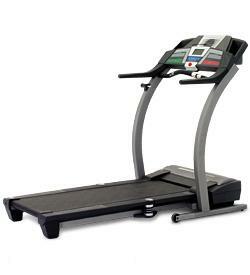 The Image Advanced 1400 treadmill provides one of the best values for a treadmill below $700. Considering its price tag, the features and quality that this machine offers is definitely hard to beat. No wonder other websites regard this as a best buy treadmill in their respective reviews. If you’re looking for an entry level treadmill, then this would be one of your better choices. It has nearly everything that you could ask for. It can even compete against treadmills twice its price, and probably beat some of them. The Image Advanced 1400 features a 2.25 CHP commercial Mach Z drive system with an axle fan which reduces noise while at the same time extending the motor life by cooling internal components. This motor is capable of up to 10mph and up to 10% incline. This is good news for those who love intense workouts. The 19” x 55” tread belt gives enough room for you to walk or run. Plus, it is made to reduce noise so you can concentrate on your exercise. Together with this belt is the ProShox impact absorption cushion. It is an air based cushioning system which reduces joint impact by up to 32% compared to road running. This machine also comes with 10 built-in workouts to give users more variety depending on what your gaols are. Plus, the iFIT interactive personal training feature provides you with the motivation, coaching and personalization to make running more exciting and efficient. The ClearView backlit console shows you necessary feedbacks regarding your workout. These include your speed, time, distance, incline, pace, calories burned, heart rate and pulse. In addition, it also comes with an extra-wide viewing angle so you can easily read these workout information. Other features include a two-speed CoolAir workout fan which keeps you cool and comfortable especially during those long and grueling workouts, and the EKG heart rate monitor that reads your pulse for heart rate workouts. The biggest weakness of this machine is its warranty. Although it comes with a 12 year motor warranty, its parts and labor warranty is only available for 90 days. This means that cheap parts were used in manufacturing this machine. If you plan on buying an Image Advanced 1400 treadmill, I suggest you buy from Walmart.com. They offer the lowest price on the net. You can get it for just $699.87. As an alternative, you may also want to buy directly from the manufacturer through WorkoutWarehouse.com. But you should only do so if Walmart runs out of stock because you can save $100 through Walmart.